Trading is a tricky business, but it is still a business. Like any business, success depends on numerous factors, including mastering your business area, making good decisions, executing well, and having the best tools at work in your business. You must master a wide variety of skills (emotional, psychological, and mental), you must make good decisions when developing trading strategies, you must execute trades with discipline, and you must utilize the best trading tools. The tools include trading analysis software and timely and accurate data to make the software useful. Here at Tradersonly.com, we can help you utilize the best trading tools for your trading business. TradersOnly.com provides historical and end-of-day market data for over 70,000 traders, investors, and money-management professionals around the world. TradersOnly is proud to be the only Authorized and Recommended data provider for VantagePoint Intermarket Analysis Software. 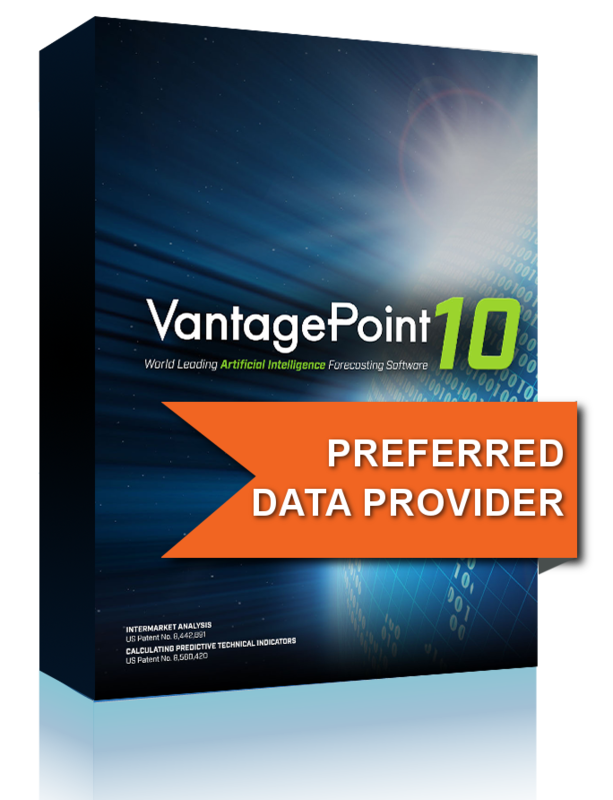 The VantagePoint software relies on global market data in order to calculate it's highly accurate market forecasts. Through a strategic partnership, TradersOnly provides all of the data in one easy nightly download for VantagePoint users. All intermarket data required has been pre-determined so customers can get the nightly download without having to do any “work”. Whether you are trading stocks, futures, forex or ETFs the TradersOnly data package will provide everything VantagePoint needs. As VantagePoint customers expand into new areas of the VantagePoint market coverage TradersOnly provides the necessary data at no additional cost. End-of-day prices for all major and cross currency pairs. As a VantagePoint user, I subscribed to TradersOnly for my data needs and am thrilled that I did. Every day, my data arrives like clockwork and it is flawless. Excellent data and excellent service makes my trading life easier, for sure. TradersOnly provides the data fuel that makes the VantagePoint Software engine perform so well for me. The data is timely, accurate and comprehensive – essential to make trading decisions based on sound analysis.